Dangerous winds swept across the tri-state Monday, ripping down wires and utility poles, felling trees and sending debris flying in the heart of midtown Manhattan. The gusts, which topped 60 mph in spots, according to Storm Team 4, caused widespread outages and travel havoc. Before dawn, high winds had already been blamed for a downed pole and wires in the heart of midtown Manhattan, jamming traffic near 34th Street as the Monday morning rush got underway. 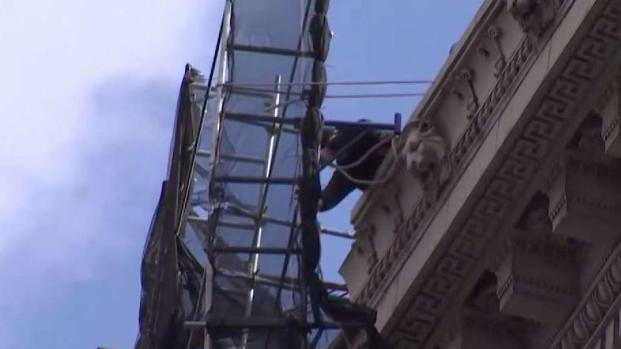 A major emergency response for a loose scaffold was underway a short time later at a 12-story building on Fifth Avenue. The street was closed in the area, between East 71st and 74th streets. Officials said it would stay shut for hours. Unsecured scaffolding hung from building on the Upper East Side after high winds Monday. Jamie Roth reports. Photos posted to social media showed the scaffolding, which stretched multiple stories, appearing to bow away from the building as gusts neared 50 mph in Manhattan. The FDNY had the entire immediate area cordoned off. Later, fallen scaffolding on Wadsworth Avenue between 178th and 179th streets forced MTA bus detours. And flying debris shut down 50th Street between Eighth and Ninth Avenues. The city's Department of Buildings said it would be performing random spot-check inspections of construction sites to ensure all were secured. Rush-hour transit saw impacts Monday evening, as the MTA reported fallen trees on tracks was affecting B and Q subway lines; southbound service is stopped on those lines south of Prospect Park. Check mta.info for the latest updates. 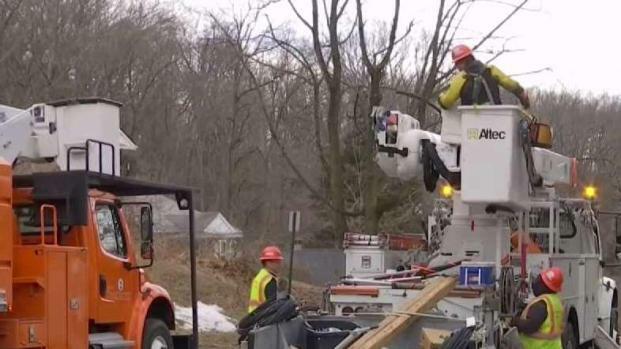 Trees and telephone poles were reported down in central and northern New Jersey, and more than 40,000 customers were without power by early Monday. In Sea Bright, the strong winds brought down live wires; there were reports an entire apartment building had to be evacuated because of the electric threat. 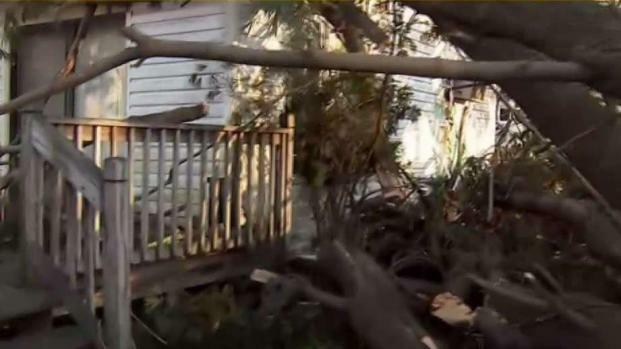 A neighborhood in Perth Amboy was evacuated when a giant tree and at least one utility pole came crashing down onto homes, ripping up the sidewalk. A massive tree toppled onto a home in West Orange, New Jersey. Michael George reports. Wires also came down near a school in Saddle Brook. Footage from the scene showed the still-smoking wires in the middle of a street as crews roped off the area. The damaging winds were expected to wreak havoc on travel all day, with Storm Team 4 warning some of the anticipated gusts could be enough to flip certain kinds of vehicles, including SUVs and vans. Flying tree limbs were also a concern, both in terms of driver safety and sudden unexpected roadblocks. 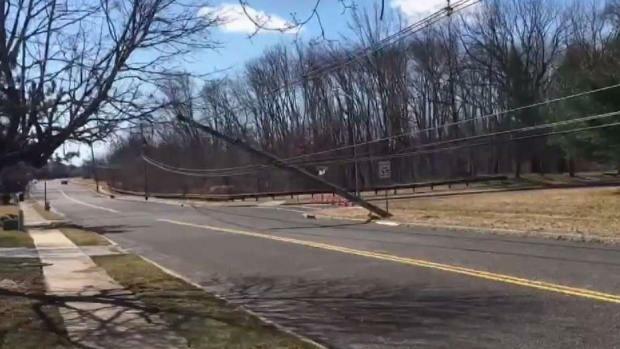 High winds Monday caused widespread power outages in New Jersey and sent some students home early. Jen Maxfield reports. Empty tractor-trailers and tandems were banned from traveling across the seven MTA-maintained bridges in New York City starting at 10 p.m. Sunday, the governor's office said. All tractor-trailers and motorcycles were banned from the Verrazano and Whitestone bridges by early afternoon; the Whitestone bridge was reopened to commercial traffic by 9 p.m. Scroll down for real-time transit updates. Gusty winds have knocked down trees faster than crews could clean them up in Westchester, making it difficult to get around. Marc Santia reports. LaGuardia Airport ordered a full ground stop just after 8 a.m. as 47 mph gusts tore through; the full stop lasted about an hour. By mid-morning, Newark Liberty International Airport, which recorded a gust of 56 mph, had implemented a traffic management program that was causing average inbound delays of more than 3.5 hours. The strongest gusts were noted in Orient and Bayville, New York, which clocked ones at 69 mph and 66 mph, respectively, before lunch. 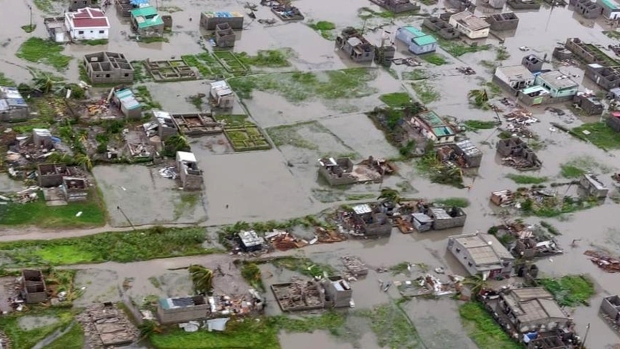 An additional 150 National Guard members were activated to help clear debris, Gov. Cuomo said. He also said utilities were on call to prepare to outages. Winds north of the city topped the charts early Monday, with Niagara Falls seeing gusts near 75 mph. The last high wind warning for New York City was issued on March 2 of last year, when the city experienced wind gusts of 67 mph at John F. Kennedy Airport. The highest winds that day were on Long Island, where 78 mph gusts were recorded in Nassau and Suffolk counties. Temperatures are expected to be cooler Monday, capping out around 40 degrees, with gusts keeping wind chills in the teens and 20s, Storm Team 4 says. Temps drop back into the high 30s on Tuesday and plunge just below the freezing mark on Wednesday, which brings the next chance for snow.